The Anangu Pitjantjatjara Yunkunytjatjara Lands is a vast area located in remote South Australia, near the tri-state border with the Northern Territory and Western Australia, covering over 103,000 square kilometers, or just over 10% of the state. The area is home to around 3000 people of Aboriginal descent. There are seven main communities on the Lands and seventeen homelands. The APY Lands were returned to the traditional owners in 1981. The Lands are owned and maintained by the Ngaanyatjarra, Pitjantjatjara, and Yankunytjatjara people of the Central and Western Desert, the Anangu. Anangu share many things, including language, Tjukurpa (Law and tradition), complex knowledge of Country and its sacred sites, as well as a common history of unbroken connection to the land. For many people living in the desert, history and the basic laws for human existence are largely written in the land, making place a vital part of Aboriginal desert culture. This history and extensive knowledge of Country is passed on from generation to generation as Tjukurpa, the Pitjantjatjara word for the overarching laws and stories that encompass the worldview of the Anangu. Many of these stories are recorded and explored orally and through inma (ceremony), as well as in painting and other creative mediums. There are seven established art centres in the APY Lands. Starting from the west, they include Ninuku Arts at Kalka, Tjungu Palya at Nyapari, Tjala Arts at Amata, Ernabella Arts at Pukatja, Kaltjiti Arts at Fregon, Mimili Maku at Mimili and Iwantja Arts at Indulkana. The art centres are 100% Anangu owned and operated. They provide a community hub, a place for sharing and passing down of culture and knowledge from one generation to the next, support of cultural practices, the ethical production and sale of the artists works, and a platform for artists to be positioned within the Australian and international art movements. Ninuku Arts represents artists from Kalka and Pipalyatjara, both small communities located 200 km south west of Uluru and the most remote of the art centres on the APY Lands. The art centre takes its name from the Ninu Tjukurpa (bilby songline) that passes through Kalka where the art centre is located, and was established by Ananguku Arts and Culture Aboriginal Corporation in 2004-5. Ninuku Arts is housed in a mud-brick building (the only one in the Lands), which was built as an office in the early 1980’s and has since been extended to accommodate a growing number of artists. Tjungu Palya was established in 2005 by artists from the Kanpi, Nyapari and Watarru communities. Tjungu Palya (meaning “Good Together” in Pitjantjatjara) is located at Nyapari, in the majestic Mann Ranges known as Murputja, approximately 450km south of Alice Springs and 100km from the Western Australian border. These ranges known to Anangu as Murputja, likening the mountain to the bony ridge of a person’s spine, are the source of many water holes and traditional camping places. Kanpi lies 15 km away from Nyapari, with the mountains also forming a backdrop to the community. Watarru is located near Mt Lindsay about 90 km east of the Western and South Australia borders. In the past 10 years since its incorporation in 2006, Tjungu Palya has grown to be a dynamic and innovative community art centre. These artists have a deep connection to country, expressed with integrity, beauty and a bold creativity in canvas paintings as traditional stories of the ancestors journeys are retold. Tjala Arts is situated at Amata, a large community about 380 km south west of Alice Springs, at the western end of the Musgrave Ranges. The practice of art and craftmaking at Amata since the early 1970’s led to the formation of an art centre for women in 1999 called Minymaku Arts, later renamed Tjala Arts as more men and women in the community became involved. Tjala means Honey Ant in Pitjantjatjara and is an important creation story or dreaming for the area. Tjala Arts is known for its diverse range of styles, energetic mark making and rich colorful palette. Artists explore Tjukurpa (stories, dreamings) of the region and create paintings which are filled with artistic integrity that immediately captivate their audience. Tjala Arts artists embrace a variety of media including acrylic paint on linen, traditional punu (wood work) and tjanpi (sculptural fibre weaving).Young Artists also explore more contemporary mediums including photography, film and sound work. Ernabella Arts is Australia’s oldest running Indigenous art centre in Australia, established in 1948 at Pukatja community, at the eastern end of the Musgrave Ranges in the far north west of South Australia. Pukatja was the first permanent settlement on the Anangu Pitjantjatjara Yankunytjatjara Lands (APY Lands), with the Presbyterian Board of Missions later establishing a craft room for Anangu women. The first craft products were hand-loomed woven fabrics and hand-pulled and knotted floor rugs with a distinctive pattern that became known as ‘the Ernabella walka (design).’ In recent years, long after commencing working as artists, senior women decided to leave behind the walka of the early days and to depict their Tjukurpa (sacred stories of country and law). The centre’s inimitable reputation lies in the adaptability and innovation of the artists who have been introduced to many different mediums since the craft room began. Today its varied group of artists is a mix of young and old, men and women. Kaltjiti Arts and Crafts is a community based art centre based in Kaltjiti Community (Fregon). It was established in the mid-1970s in the wake of successful crafts being made at Ernabella Arts, some 65km away by road. Kaltjiti is situated on the plains approximately 45 km south of the Musgrave Ranges, within a desert landscape of sand dunes and sandy clay flats vegetated with mulga scrublands and spinifex. The heart of the small community is the art centre and a place of inspiration, dynamism and a cultural focal point for the area. 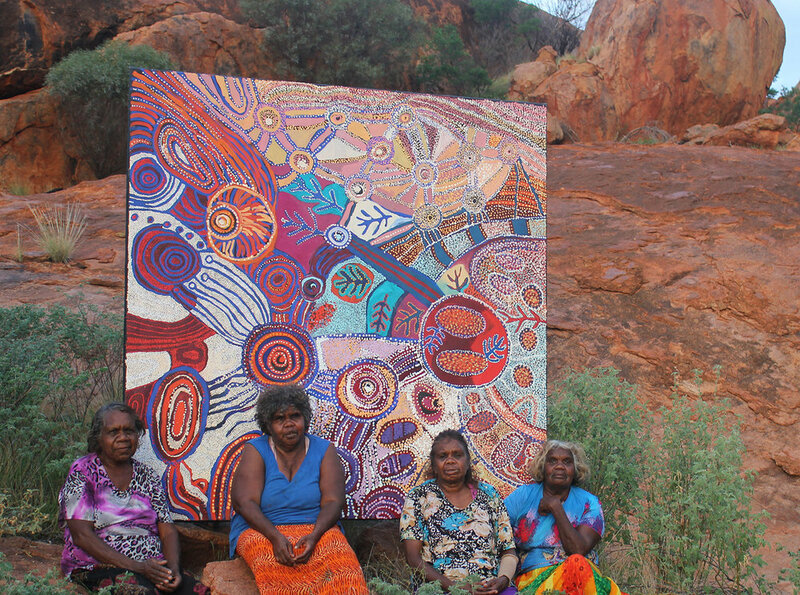 Through their artworks, elder artists teach younger generations about important cultural traditions and stories, passing on knowledge that has come to them from their ancestors. 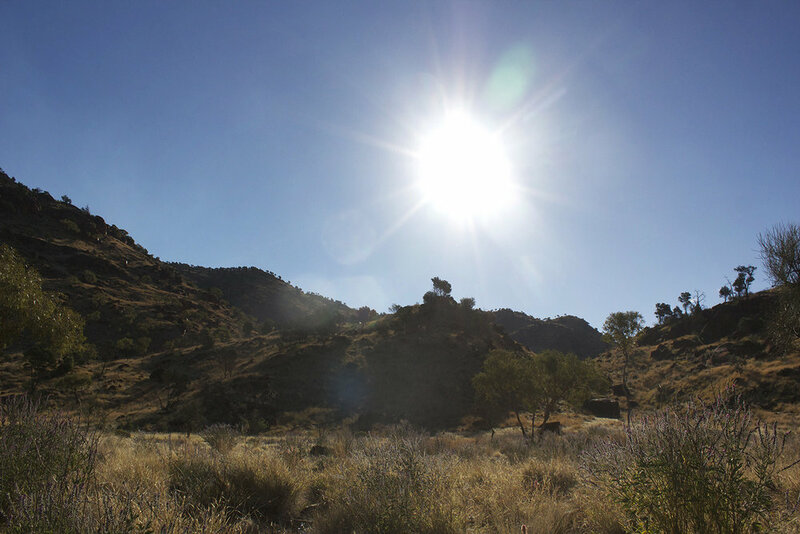 Mimili is situated approximately 500 km south-west of Alice Springs, at the base of the Everard Ranges. Mimili Maku is the most recent APY Land art centre, established in 2004, and takes its name from the maku or witchetty grub found in the roots of the witchetty bush (acacia kempeana). The Maku Tjukurpa (witchetty grub songline) is a significant story from this area. Mimili Maku Arts is a vibrant contemporary art studio, supporting Anangu artists from Mimili community and surrounding homelands. Already well known for dynamic desert painting, Mimili Maku has recently developed a successful program for artists exploring photography and new-media. Iwantja Arts is located at Indulkana, approximately 575 km south of Alice Springs, on a small ridge at the edge of the Indulkana Ranges. The art centre takes its name from the Iwantja Creek where the community was first established. A large native gum growing in the creek bed marks the resting place and dreaming site of the Tjurki (Owl) and tells the story of his journey through country.